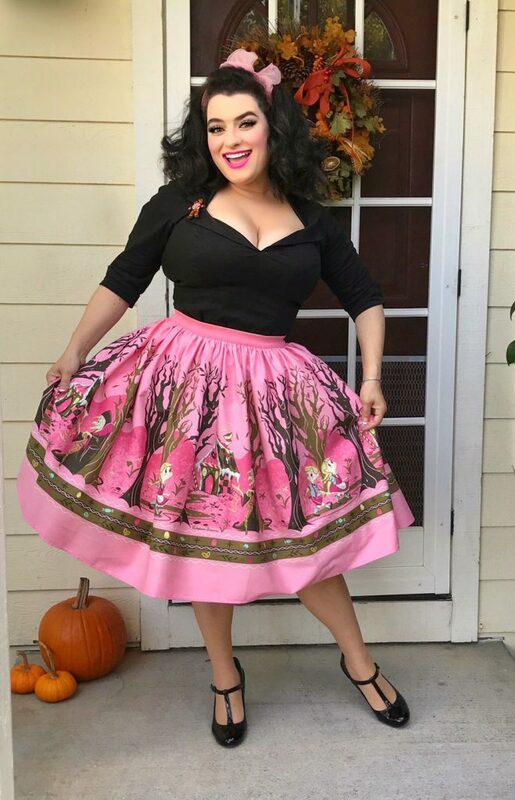 I had been waiting for the release of the Hansel and Gretel skirt by Pinup Girl Clothing and when it was released it sold out so quickly I missed it. Luckily for me and so many other pinups the 2nd release came fairly quickly and it was now all mine. I was excited when Pinup Girl Clothing teamed up with Stephanie Buscema for their Halloween Capsule Collection which includes some very limited pieces and features some very beautifully spooky sweet designs; Hansel & Gretel being one of them. 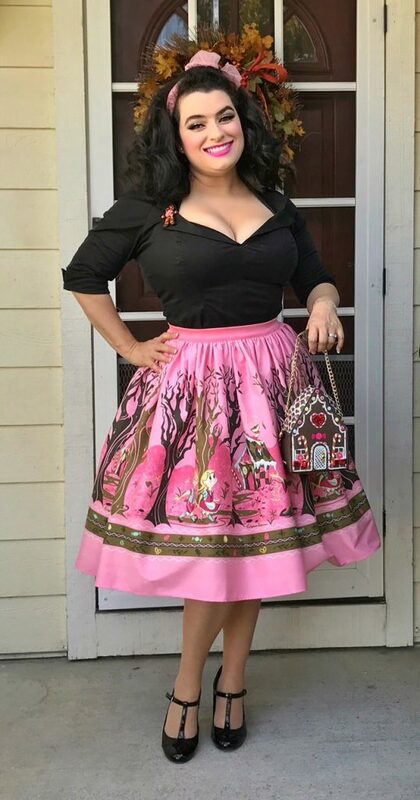 I am wearing the Jenny Skirt and it features Hansel and Gretel from the designs by renowned artist Stephanie Buscema and the what caught my eye about this skirt was the lovely artwork as Hansel & Gretel can be seen in the forest along with the scary witch and the stunning gingerbread houses and candy all set against the prettiest pink colored background. This one does not disappoint!! 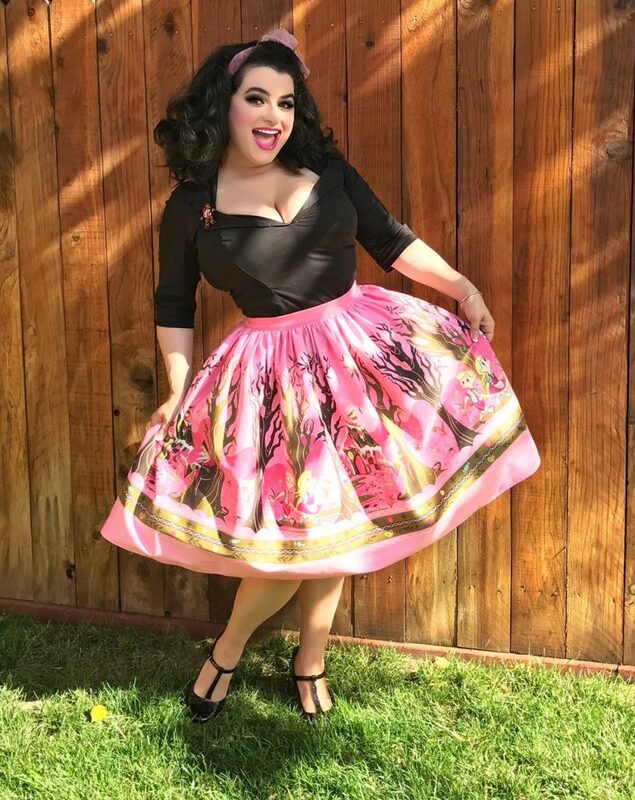 It is among my very favorite Jenny skirts from Pinup Girl. The print and colors are what this stunner is all about. This Jenny fits me spot on and I am wearing an XL, I did notice that the fabric does give a little in the waist (it is a bit elastic) making it just that much more comfy. I absolutely love the gathered waist and full hemline in this 1950s circle skirt. Colors of vibrant pinks, aqua blues, yellows, and golden browns are what initially called out to me and I knew I had to have this skirt right away. I paired it with my Pinup Girl Clothing Doris top in black which is fits my curves perfectly!! I also added a pretty pink petticoat underneath for even more fluffy fullness. The gingerbread house purse is from Betsey Johnson and I paired it with the skirt and it is perfect!! You can now also purchase the purse on the Pinup Girl website. Ladies, it doesn’t get much better than this…..a mix of spooky sweet against a pink background… perfect for the holidays!! Hurry and get your Hansel & Gretel skirt before it is all sold out as this is a limited edition print.